A landing page refers to a page on your website which is meant for converting the website visitors into leads. It enables you to capture a visitor’s details in exchange of a particular offer given by you. A landing page is a place where the customer lands when he searches your business’s name in the search engine. It is often called a “lead capture page” or a “destination page” which appears upon clicking on an offer. Business owners generally design their landing pages in an attractive manner for promoting their business or any particular campaign. The landing page does not offer any navigation and includes a form within it which converts the visitors into customers. Google or Facebook ads, email-gated content, free trial, product page, promotion page, etc. are the perfect examples of landing pages. 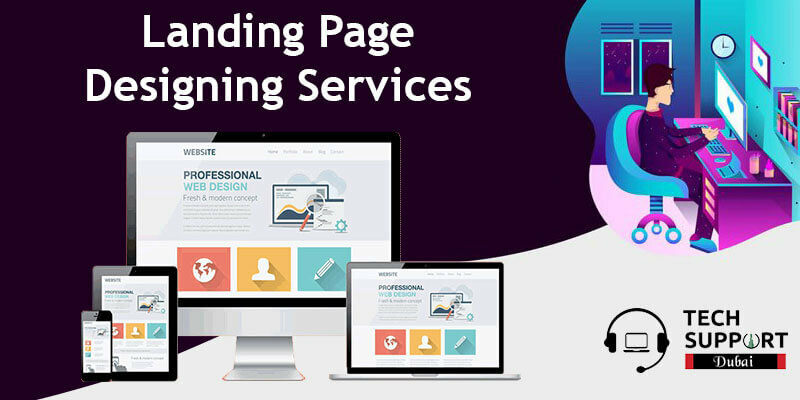 If you are in search of Landing Page Designing Services, connect with our tech specialists at Tech Support Dubai Call us, mail us or chat with us to avail our advanced services at an affordable price. You can use these pages to generate leads and convert your visitors into customers by providing them with them several additional benefits. Some of those are ebook, industry report, online course, case study, etc. Additionally, it helps to increase the sale of a specific product or service within a short span. We can create a unique landing page for you which will encourage your visitors to turn into your potential buyers. Our experts work tirelessly until you are completely satisfied with our work. We will continue to follow up with you to know the return of your investment with us. Our professionals have years of experience in developing thousands of exclusive landing pages. Thus they can guide you in the best way to create the best landing page for your business. Connect with us and enjoy our premium services. If you are searching for affordable Landing web Page Designing in Dubai, connect with us to experience unmatched service. Place a call at our helpline number: 042053349 to connect with our experts. They will offer you thorough assistance regarding the development of your landing page. In addition, you can drop a mail to us to get in touch with us during busy working hours. You will receive a call back from us within the next 24 hours. Get in touch with our experts at Tech Support Dubai via our live chat window. We also provide SEO Web Designing Services in dubai.